Korma / Qorma / kuruma is a South Asian dish prepared with meat or vegetables. Here am sharing with you the traditional authentic malabar korma recipe. Korma is a mildly spiced and coconut or cream based thick gravy and may use lamb, chicken or beef. If you love a spicier korma recipe then you can add thai red paste or thai green paste. As i promised you earlier, here is the recipe for malabar beef korma which is requested by many of my readers. This curry recipe with beef is absolute hit among my family members and relatives. 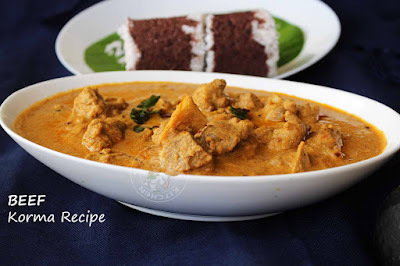 Trust me, this is a very tasty and delicious curry recipe from North kerala (malabar). Ramadan is very close by and this korma is a very common dish in malabar especially during the holy month of ramadan. Pathiri with beef korma is one of the popular dishes for ifthar. Chicken korma , mutton korma, veg korma are some other common korma recipes. 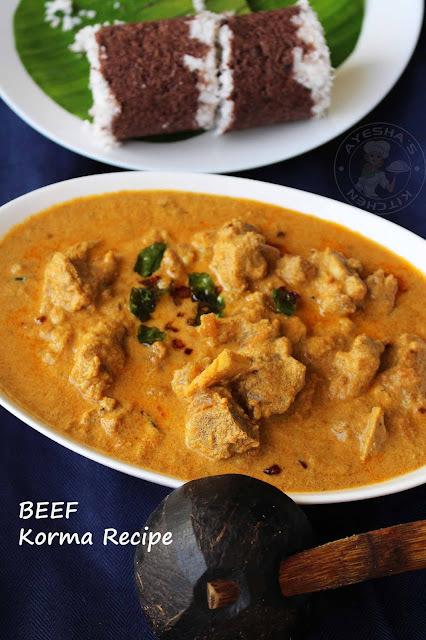 So lets move on to the kerala style elegant beef korma recipe. Recently i have been getting many requests for vegetarian recipes. That's why i am posting non veg recipes these days. But somehow am managing to post some non veg dishes also. So here am again with yet another glorious kerala recipe. Truly speaking, Kerala recipes or malabar dishes are one of the most delicious cuisines in the world. Spicy fiery curry to mildly spiced curry recipes makes kerala recipes so special. Each and every veg and non veg dishes has its own unique flavor and taste. And the cooking techniques and methods are entirely different from other cuisines. Korma, whether it is chicken korma or beef korma, i always love pathiri and korma combination. 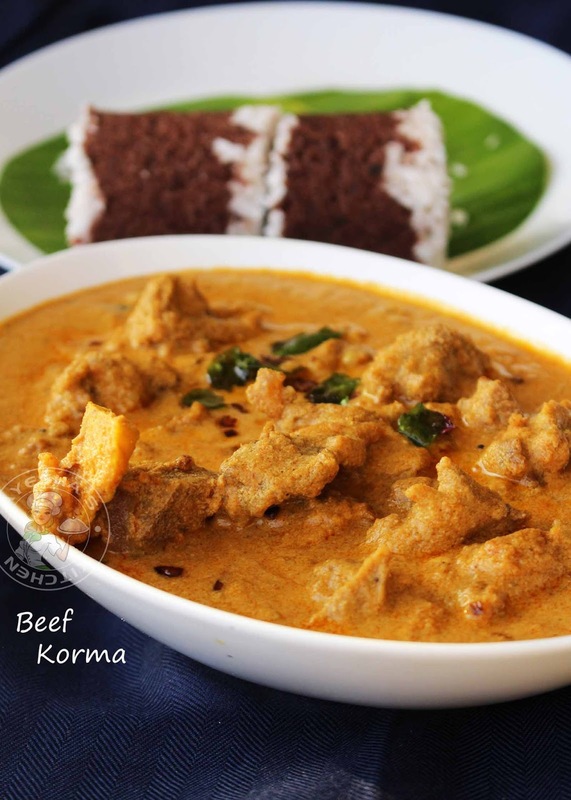 Malabar soft and light ari pathiri is the best ever combination with this beef korma. My mom used to make this curry in every weekends in my school days. That's our family favorite curry those days. Hope you all will try this korma recipe for sure. Please drop your valuable feedback below in the comment box. So here is the recipe showing how to make malabar beef korma / kerala style kuruma recipe / beef dishes / beef recipes / beef curry recipes / malabar recipes / ramadan recipes / korma curry. Wash and drain the excess water in beef pieces. Set it aside. Now heat oil in a pressure cooker and add the sliced onion. Saute it well until soft. To this add crushed garlic, green chilies and saute until raw smell disappears. Now add tomatoes and saute for a minute. Then add turmeric powder, chili powder, coriander powder. Combine well. Finally add the drained beef pieces and combine very well. Add salt, mix thoroughly and cover it with the lid. No need of adding water as beef itself will release water once heated. Pressure cook it for 3 whistles (it depends upon the tenderness of meat . so cook accordingly). Open the lid once the pressure releases. Transfer the cooked beef to a deep bottomed wok or any other vessel along with the gravy(it is optional only). If the gravy is watery ,cook again so that the gravy becomes thick . Now grind together grated coconut, fennel seeds, shallots along with half a cup of water to a fine smooth paste. Now add this coconut mixture to the prepared beef gravy. Combine very well and cook until oil floats on the top. When done, add 1 tbsp of curd to it. This is optional but adds taste to the curry. Mix very well. Check for salt. Remove from flame. Now heat oil in a frying pan for seasoning. Once hot, add chopped shallots and curry leaves. Fry them and pour it over the curry. Next step is optional but it gives a fine texture to the curry. So for that again heat a tbsp of oil and make the flame very low. To this add chili powder and immediately add salt. Roast it over a low flame until done and pour this over the seasoned curry. Cover it until you serve. Malabar beef korma is ready. Serve along with paratha, chapati, ghee rice etc.